When she and Zach reached up at the same time, to grab a handful of prepackaged ornaments, Beth found herself nearly wrapped within his arms. And there it was again, Beth thought, when she searched Zach’s eyes. She held her breath. Was he going to kiss her? Zach broke the spell when he abruptly pulled away. “Sorry.” Kyle was beginning to wander down the next aisle, and Zach scrambled to catch up with him. Why was she suddenly feeling so disappointed? She barely knew the guy, Beth admitted to herself, halfheartedly. After counting out a half a dozen ornaments, she took in a shaky breath, before strolling over to where Kyle and Zach stood waiting near the checkout counter. Before long, they were back on the road, with the radio switched onto a channel exclusively featuring Christmas music. 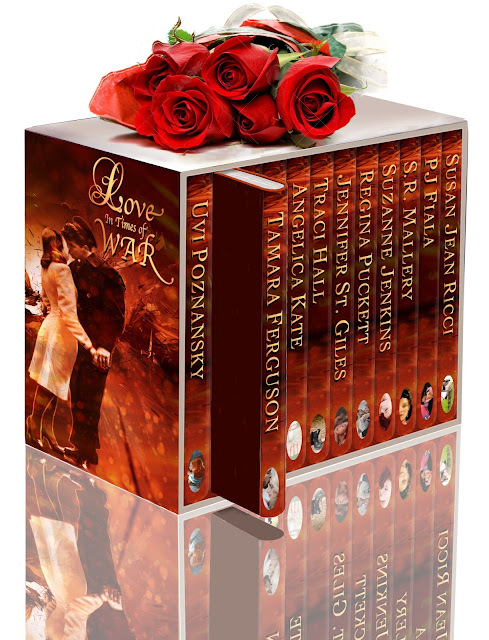 "This anthology consists of twelve wonderful stories with the inherent theme of love and war contained in them. Out of the twelve authors, Uvi Poznansky is the only one that I was familiar with previously. So, in addition to becoming acquainted with new authors in this set, my 'to be read' pile has grown considerably. That is not a bad thing with the wind chill of a minus 10 as I write this review!!"